One of the seven angels who had the seven bowls full of the seven last plagues came and said to me, “Come, I will show you the bride, the wife of the Lamb.” And he carried me away in the Spirit to a mountain great and high, and showed me the Holy City, Jerusalem, coming down out of heaven from God. It shone with the glory of God, and its brilliance was like that of a very precious jewel, like a jasper, clear as crystal. If you want to get thousands of “likes” on Facebook, make your status say something like this: “I love Jesus so much. But I can’t stand the church.” Or, if you want to sell a bunch of Christian books, write about how messed up the church is compared with how awesome Jesus is. If we truly love Jesus, then we will love what he loves. This means we will love the church, warts and all, and cooperate with Christ in his work of sanctifying and cleansing the church. We will invest our lives so that the church might be healthy and strong. Yet, it’s not just Facebooking Millennials and cranky Christian authors who are down on the church. I spend a lot of time among marketplace leaders who would echo the negative sentiments of the last paragraph. The church did not speak to the issues of their professional lives, so they are bugged with the church. Some keep going with the church; others don’t. In place of church, they connect with parachurch faith/work ministries, some of which embody a subtle anti-church bias. Now, before you accuse me of ignoring the church’s failings, let me say that I agree with most of the common criticisms of the church. It’s true that the church often gets so wrapped up in itself that it fails to serve the people for whom it exists. And it’s sadly true that the church has tended to ignore the marketplace as well as its calling to prepare business folk to live out their faith in their work. Indeed, the church has ample failings (because, of course, it’s made up of people like me and you, people with our own ample failings). Let’s be clear, however, that the shortcomings of the church do not give us a good reason to give up on it. Why not? Because the church isn’t just some disposable, fallible, human institution. According to Revelation 21:9, the church is “the bride, the wife of the Lamb.” This same metaphor occurs in Ephesians 5, where the church is portrayed as the bride of Christ. Christ gave himself up for the church “to make her holy, cleansing her by the washing with water through the word, [and presenting] her to himself as a radiant church” (Eph 5:26-27). So then, if the church is the bride of Christ, metaphorically speaking, I suggest that whatever the flaws of the church, we would do well not to simply disparage the church or turn our back on it altogether. If you said you loved me but you despised my wife, I would conclude that you don’t really love me at all. How can you love someone but despise what that person cherishes? How can we love Jesus and despise his bride, in spite of her admitted flaws? If we truly love Jesus, then we will love what he loves. This means we will love the church, warts and all, and cooperate with Christ in his work of sanctifying, cleansing, and building the church. We will invest our lives so that the church might be healthy and strong. If the church is failing to address an essential issue, if it’s failing to serve people in essential ways, then we, as members of the church, will help it to do what it needs to do. There is surely a time and place for criticism of the church that leads to improvement. There is surely a need for parachurch ministries, as long as they are truly “parachurch,” meaning “alongside the church,” not “against the church” or “replacing the church.” But if the church will one day be the radiant bride of Christ, then we would do well to love the church and do our part as members of the church to help her become all that Christ envisions. Can you relate to those who have given up on the church? If so, why? If not, why not? How can we love the church — really — when the church is filled with so many problems? In what ways might you demonstrate your love for the church this week? Gracious God, we’re struck by the fact that the church is portrayed in Scripture as the radiant bride of Christ. In many ways, the church we know doesn’t measure up to this picture. Forgive us when we let our disappointment in the church turn to bitterness. Forgive us when we fail to love your bride, Lord. Help us, we pray, to love the church in spite of her many flaws. Help us to find ways to serve the church, to help it grow in holiness and stature. We pray for your bride, Lord, that she would be truly radiant, truly holy, truly glorious, truly devoted to you. May we help this to be true. Amen. Just as a woman who toils for her family and friends, so we more so as the Bride of Christ, should, as long as our days, serve believers and unbelievers showing Christ’s scarificial love. You state “If we truly love Jesus, we will love what he loves.” If a church isn’t doing what they have been directed to do, does Jesus love that church? If a church is headed by a Pastor who is committing sins, does Jesus love that church? If a church actively discourages types of people, are they a church Jesus loves? With so many churches fighting amongst themselves and setting themselves up as “the” good church, are they truly Christ-like? 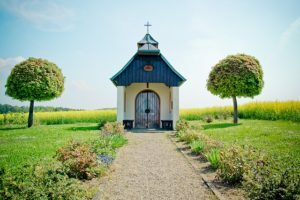 I understand why people give up on church – it has become so self-absorbed and insular, if you are a little different or believe one iota differently, you aren’t welcome there anymore. If the church body wants to be considered Loved of Jesus, they should make a much harder attempt at being the organization Jesus set forth. Thanks, Mischelle, for your comment. The good news is that Christ’s love is not dependent on our actions. He love us – and loves his church – even when we are not acting in a way that honors him. Now, we shouldn’t let this be an excuse for wrong behaviors. But we can be confident in Christ’s love even when we fail, and this is truly good news. Thanks, Catharine. Ugh. I hate making that mistake!